I told students there were three ways to read a book. Then I asked them if they could name them. They easily came up with "read the words" and "look at the pictures." These are actually the only ways I talked about today. I am saving "retell the story" for tomorrow. 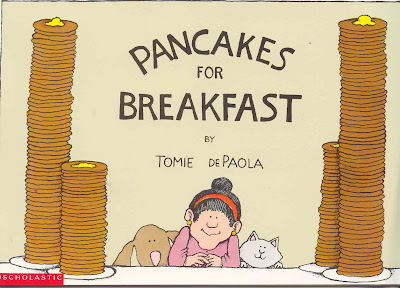 First we read the wordless picture book Pancakes for Breakfast. On each page I pointed out details and asked questions that helped my students tell the story. 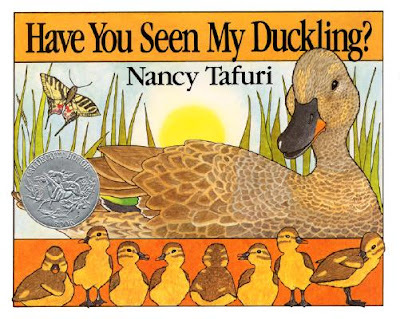 Every few pages I reminded my students that we were reading the book by looking at the pictures. They loved this! 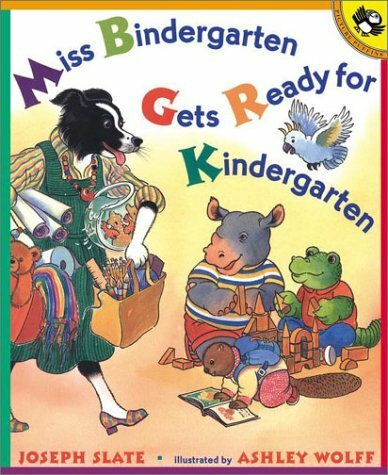 Then we read the book Miss Bindergarten Gets Ready for Kindergarten. 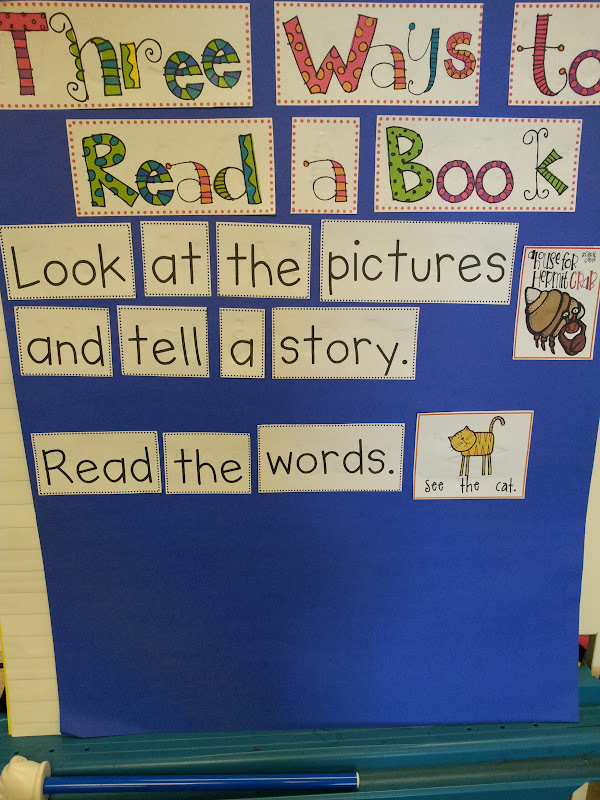 Once again I reviewed that we can read books by looking at the pictures and by reading the words. Miss Bindergarten is perfect for both ways because all of the pictures go hand in hand with the text. As I read the words I pointed out the pictures that went with them and we talked about how we would be able to retell the story easily be only reading the pictures. After we finished reading both books we made part of our anchor chart for three ways to read. My anchor chart pieces came from Kim Adsit's Blasting Off With Reader's Workshop unit. We put them on the chart together and read them several times. I explained that we were making the chart to help us remember the three ways we can read a book. Tomorrow I plan to use the Kissing Hand to talk about the third way to read a book- retell the story. I also plan to revisit reading a book by looking at the pictures using Have You Seen My Duckling. Thank you so much for blogging about Daily 5 in K! I am starting Daily 5 this year, too. My school year doesn't start until next week so I am still busy planning and your blog is so helpful! I'm also starting Daily 5 this year in my K. class. I've read the book twice over the last two years...but just now feel ready to give it a try. I'm at a Title One school--lots of ELL's and a few ESE's....most only watch TV--no books at home. I'm going to be following your blog for ideas--Thank you so much already for the titles you are using...I'm off to get more card stock for kim's reader's workshop unit. I was able to attend the "I Teach K" coference in Vegas--she is such a help to all of us--as is all the other bloggers....thanks again!! You're off to a great start! I love the font you used for the Three Ways to Read a Book! I'd love to see more pictures of how you implement the Daily 5. 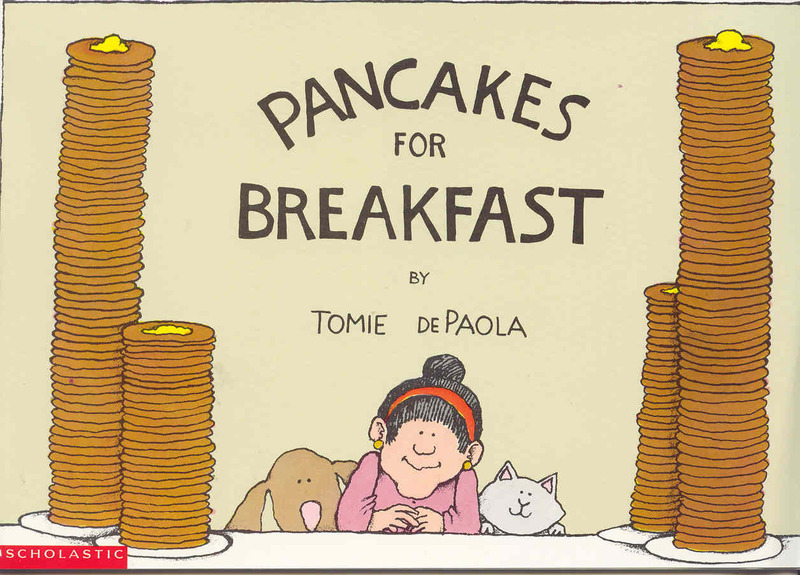 I totally forgot about about that Pancake book! So fun! I also forgot about Pancakes for breakfast. Mine's the Best is another good wordless book. I am getting ready for next week...Yay! I wish to discuss a bit of great news to any or all person. I obtained a couple free prescription glasses on the internet.